I think it's still the case that more people finished the last PBP than have ever finished LEL. All who finished PBP had done an SR series. LEL finishers are the largest group which might not have had that grounding for a 1200km+ ride. Concerns about qualifiers in the past were from those with little experience. An LEL finish without Audax experience turns those concerns on their head. 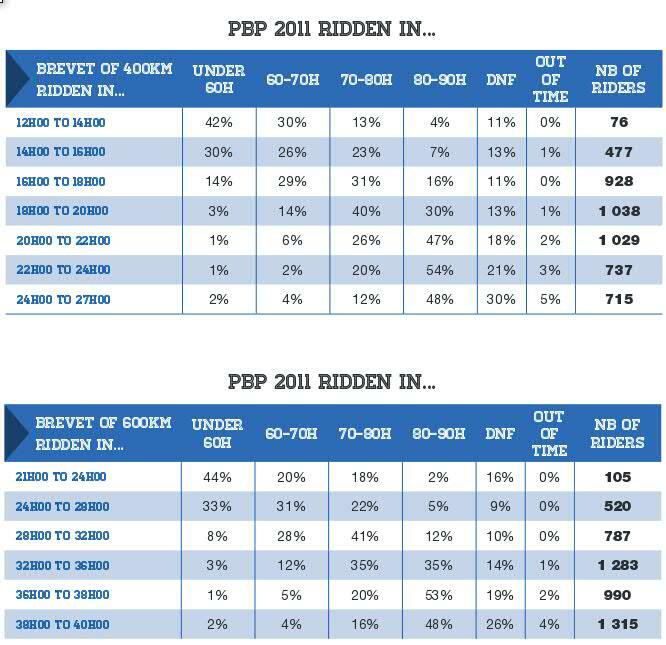 It might be useful to gauge interest in PBP by finding out who is riding 400s and 600s this year to pre-qualify. Some sort of check-box at entry perhaps. More interesting would be to work out just what proportion of LEL finishers (and entrants) did an SR (or similar in the past). I know there's plenty of anecdata about X and Y for whom it was their first Audax, etc, but some more solid stats may make 'interesting' reading. Personally if I couldn't ride a qualifying 600 in 33h** I wouldn't enter PBP. But that's because I like comfortable margins and had no wish to ever be anywhere near a cutoff time, and the more so if I had time and money invested in the project. Depends on how you deal with sleep deprivation, etc. I'm slow but steady so adding distance is not really a problem. The only BRM 600 I've ridden I finished in 39h20 or so. The other BR 600s I finished were over 40h. Don't think I've finished a 400 in under 26h either. Had relatively little trouble on the one PBP and LEL I've done (finished both with a couple of hours spare and under 10h sleep on the way round). Some people might get scared away by advice of "sub 33h 600 or sub 22h 400". I'm beginning to get a little worried, even at this early stage. I hope to ride a 400 and a 600 this year so should by all accounts be ok for pre-registration. What concerns me is the qualification and rides selling out before I have a chance to enter. I guess it means being a little more organised making sure I am there when entries open. PBP isn't a reality for me in '19, so I'll be thinking carefully about what events I enter during the qualification window, and trying not to tie up a BRM place. I wouldn't be surprised if others took a similar approach - I'm sure you'll get a place in qualifying rides. I'd super deffo opt for the 84hr/Morning depart, assuming its offered. The first ~30hrs of the 90hr evening depart (which means you'll likely have been awake around 40hrs before sleeping on the second night) is a killer. A morning start without the extended queuing to depart is well worth swapping for an extra 6 hours being knackered on the road. YMMV of course. Conversely, having done the 84hr 5am start in 2011 I would not recommend it at all. Instead of adrenaline carrying you through the first night and carrying on until late evening on night 2, you're up at 3am to start at 5 so knackered by midnight, then a few hours sleep puts you on or behind the time limits for some extra stress the next day. Couple that with the complete lack of atmosphere at the start and the first 100k, I'd definitely go for the 90hr if you're a first timer. Having done 90 and 84 previously I'm going to complete the set with an 80hr start next year and get a few extra hours of daylight riding before physical collapse on night 2. Your right the 80hr is daunting but even though I'm not a fast rider it's much easier than the 84. The 80 is easier because outward you are always with a fast peloton helping you along, the controls are empty and I also on the return I made full use of food at the all night cafes and unofficial sleep stops especially after Tinténiac. Well I have just entered my first 600 (Wander Wye) so that will go a long way to telling me how well I can manage. I am, as I always am, full of self-doubt. I'll give it a bash then go on holiday and think about how it went. Is other experience helpful .. way back in 2007 aged 65 .. just started doing audax off no bike riding background.. decided to give PBP a crack .. first 400 ever was 7across .. then the 600 was Beast from the East .. hated it .. 39 hours .. fortunately Chris S said .. Rog you are qualified .. if you do not try it .. you will not try when you are 69 .. and you will never know whether you MIGHT have been able to finish in time..really good advice. So I did a SS 600 .. and was a tiny bit happier. PBP finished in 88 odd .. and then 89 odd in 2011.. retired in 2015 at 1000 kms still just in time . Think about that Chris S advice .. I am so grateful that he got me try. On a slightly different subject, what's this "rider licence number" I keep reading about in the PBP brochure? That's your FFCT, FSGT or UFOLEP licence number of course. Is that required for forrin riders? How does an Auk get one of those? Yeah, it's rubbish. On the one hand it's 'sound' advice, but goodness sake, just do the qualifiers, get out there, and give it a whirl. It might [could well be!] be tough as regards time limit, but you may not regret it either. Only one way to find out. Prior to 2015 participants had to prove insurance. In 2015 insurance was arranged for everyone. However, French participants had to be members of the relevant bodies, although the insurance augmented their existing cover. So don't worry. For your piece of mind, the organisers of PARIS BREST PARIS have made enquiries about our insurance cover during the event. They have contacted the insurance companies on your behalf. For F.F.C.T., F.S.G.T., and U.F.O.L.E.P. licence holders, this cover supplements the insurance provided under your licence, or provides it where there is none. For acceptance, repatriation must be authorised or carried out by MODIAL ASSISTANCE. YOU MUST ALWAYS GIVE YOUR PBP COMPETITOR'S NUMBER AND YOUR FULL ADDRESS. I believe everyone who wanted a place in 2015 got one - of course, that may not be the same for 2019, but the official guidance of riding a BRM 400 in the year before will probably see you right. It's not rubbish. I don't need the experience of bobbling around 1200km on an 88h schedule to know that I wouldn't enjoy that one bit. If I qualified with a 37h 600, I'd know that would be the likely outcome. An 88hour schedule would be luxury in my book. I tend to work on a 89h30 schedule and still enjoy it. PBP2015 I rode 88h. Slept 1,5h (1+0,5). 600s I normally ride 38h without sleep. Ate mostly bread from cafe. No restaurants. I hope that I would be a little faster but no. That's the point, as a general guideline it is "rubbish" as plenty of people (including me) rode round up against the time limit most of the time but still had fun. If I'd read that and taken it seriously I may not have done PBP. I can imagine that people who are used to being at the faster end of a ride and rarely caring out the time limit might not enjoy the idea of bouncing up against the time limit, but it's how the majority of people end up riding things like PBP. Note to self: get back to Blighty by April 28th next year so I can ride my first qualifier. Alternatively, look up qualifiers in SE Asia or South America. Or qualify with 4 x 600s. There is always somebody who waits until the last possible moment to decide to qualify for PBP. Ooh, is that allowed? If you've done no rides by the end of the 200 window in April can you just do two 300s in May? Had an old clubmate that worked at sea. He did his 200 & 300 and then went off-shore for 6 weeks, returning to do 2 600s on consecutive weekends to qualify. So if I do over-distance rides then I'm allowed to leave them until the qualification deadlines for the longer distances? Thanks, that's really useful.